Eden Hazard and the Mercurial Vapor are like a good cup of tea and a digestive biscuit. On their own, they’re two wonderful things that need to be appreciated for exactly what they are. But together, they turn into something truly memorable. The Chelsea star’s love affair with the Mercurial silo is there for all to see as we take a look back at his astonishing career. After idolising so many players that wore the original Mercurial back in his younger days, Hazard’s mother bought him his very own pair and it’s fair to say that he hasn’t looked back since. He went on to make his first international appearance for Belgium wearing the Mercurial Vapor IV, while his last ever game for Lille was marked by a pair of mango-coloured Mercurial Vapor VIII’s. As for Chelsea, his club debut, first hattrick and title-winning goal were all done in a pair of Nike Mercurial Vapor football boots. With so many big moments scattered throughout his career already, and a decent collection of world-class finishes, it’s not difficult to see just how much the Mercurial has helped him enhance his game. By looking back over a career that’s been littered with trophies and individual awards, it’s fantastic to see just how the Mercurial has developed alongside a player that’s now considered one of the best on the planet. So, it stands to reason that Hazard will be absolutely delighted to unveil the brand-new Nike Mercurial Vapor Flyknit Ultra. Designed to suit his style of play and allow him to carry on those mazy runs, the new addition to the Mercurial collection is sure to strike fear into the hearts of Chelsea’s Premier League rivals. 2017. Golden Boot: Hazard will be hoping to get back to his lethal best following his return from injury. Image: nike.com. The new design sees the technology used on the Hypervenom, Superfly and Magista Obra introduced to the Vapor, and we have to say we think it’s our favourite of the lot. Engineered to allow players to unleash their explosive pace and leave defenders sat dazed in the dust, the new boots provide a snug fit through the design of the knitted uppers. 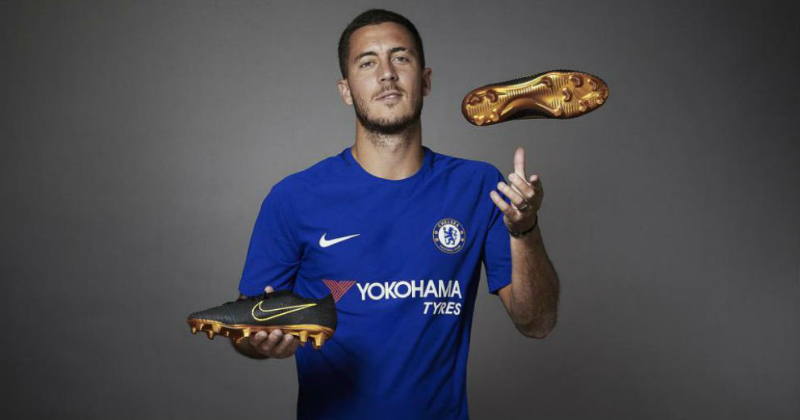 The fact that they fit so well to the wearer’s feet, and are much lighter than the other boots in the Mercurial range, means that players like Hazard will have no problem bursting down the wing this year. The Mercurial Vapor Flyknit also incorporates a ribbed exterior that provides wearers with unbelievable control when dribbling at speed- and we all know just how dangerous Hazard can be when he’s running at defenders. 2017. 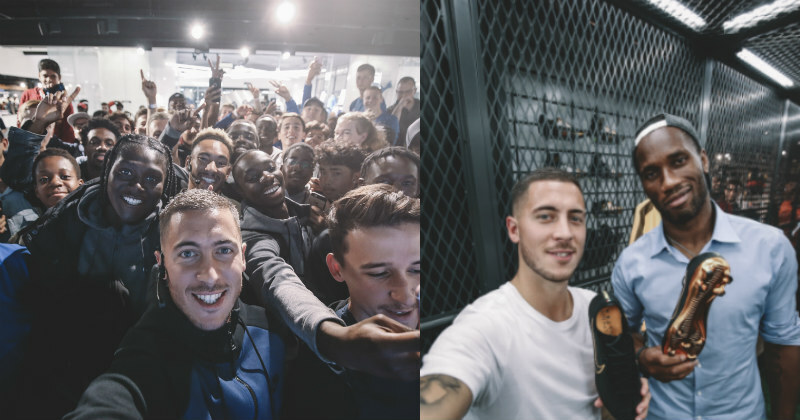 All Smiles: Hazard and Chelsea legend Didier Drogba certainly seemed to enjoy the launch event. Image: nike.com. The boots are available in very limited numbers, as Nike have released only 2,500 pairs for people to get their hands on. Hazard is also expected to exclusively wear these boots for a few weeks this season, so you certainly shouldn’t expect to see every man and his dog wearing them right away. 2017. The Boot Room: we don’t think he’s going to need quite so many pairs. Image: nike.com. But if you ‘re lucky enough to get your feet into a pair of these bad boys, then you’ll be able to choose between two absolutely gorgeous colourways. 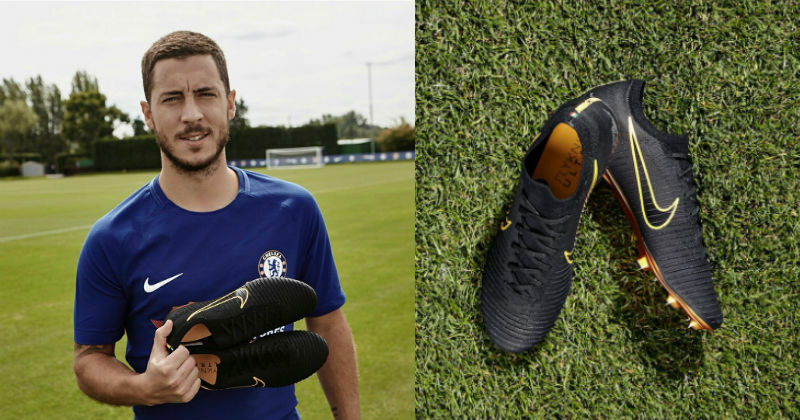 Available in both a “Triple Black” and “Black/Metallic Gold”, it’s not hard to see why Hazard seems so impressed by them, and we can’t wait to see him showing them off in the Premier League this season. Hazard made his first appearance of the season at the weekend during Chelsea’s 2-1 win at Leicester City, coming on with just over ten minutes to go in place of Cesc Fabregas. After an initial wobble against Burnley on the opening day, Hazard will be aiming to push the Blues onto yet another successful campaign. 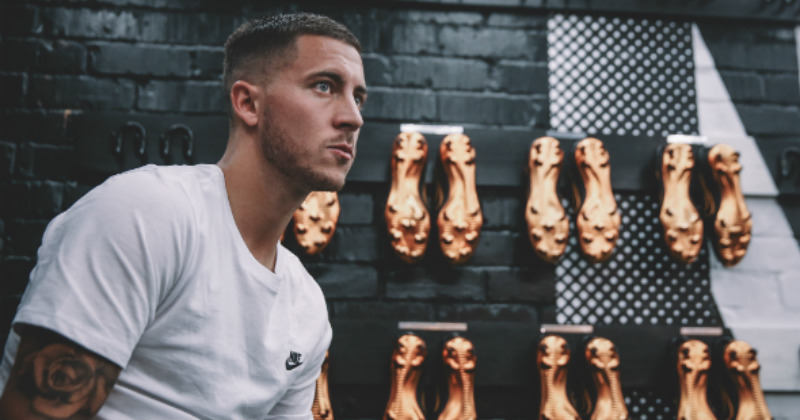 We all know that Hazard sets his sights incredibly high, so only time will tell whether he’ll be up for another PFA award this year- but the new Mercurial Vapor boots give him everything he needs to achieve exactly that.